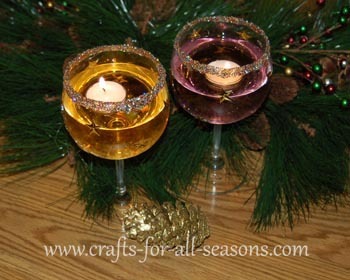 These wine glass candle holders will look beautiful on your party table this New Year's Eve. 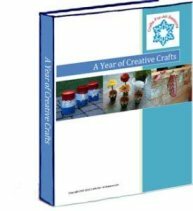 They can be made in different colors to make any holiday festive. They are made by embellishing wine glasses. Many of us may have a spare wine glass that doesn't match any others in our collection (if not, they can easily be found at any thrift store). 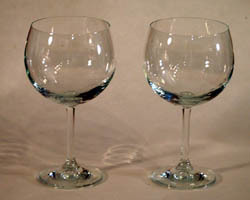 This is a perfect project to put those wine glasses to use! 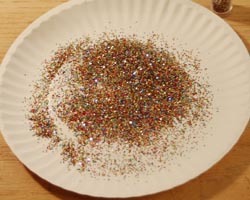 The rims are decorated with glitter, then they are filled with water tinted with food coloring. Floating candles are added for the final touch. Happy New Year! 1. 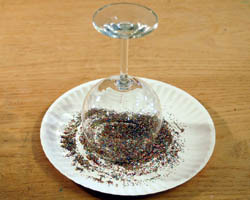 Begin the wine glass candle holders by sprinkling some glitter on to the paper plate. 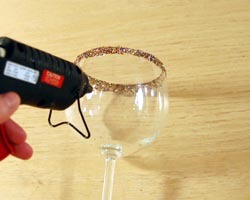 Then, draw a line of hot glue along the rim of the glass, and place the glass upside down upon the glitter to attach it to the rim. 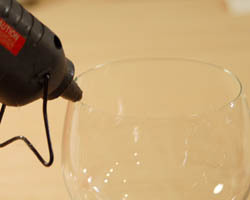 Tap the wine glass up and down a few times to make sure the entire rim is covered. 2. If you want some extra sparkle (like I did in the candles shown), add a larger border of glitter around the rim of the glass. 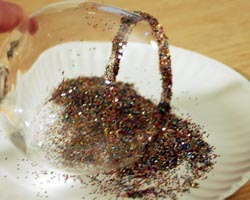 To do this, make another thick line of glue around the outside rim of the glass, and tap into the glitter. 3. 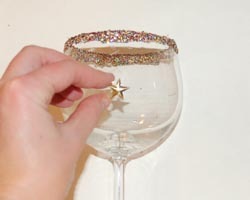 Add dots of glue around the glass, and attach a star on each drop of glue. 4. For a festive look, fill the glasses halfway with water, and add a drop of food coloring. You can also add glitter to the water if you desire. Then place a floating candle in each glass.